Feature Image: Fox with a brown winter coat in a snowy landscape. Photo credit: Pixabay. How does winter coat color affect survival? Camouflage is a strategy used by many different species to avoid being eaten by their predators. Many animals evolved to blend in to their natural environments. For example, the Great Horned Owl (Figure 1) has feathers that mimic the coloration of tree bark to hide from predators and prey alike. Some animals, however, have evolved the ability to change their camouflage color throughout the year. For example, the arctic fox is generally brown during the summer months, which allows it to blend into the green and brown vegetation. In the winter, however, arctic fox have white coats in order to blend in to the snow-covered landscape. Figure 1. The feathers of Great Horned Owls allow them to blend in to trees. Photo credit: Pixabay. The color of an animal’s winter coat is determined by its genes. In species such as the arctic fox that molt to grow a different winter coat, the genes of each individual will dictate whether the winter coat is brown or white. A recent study led by L. Scott Mills from the University of Montana set out to determine the winter coat color of eight different species across their entire range. 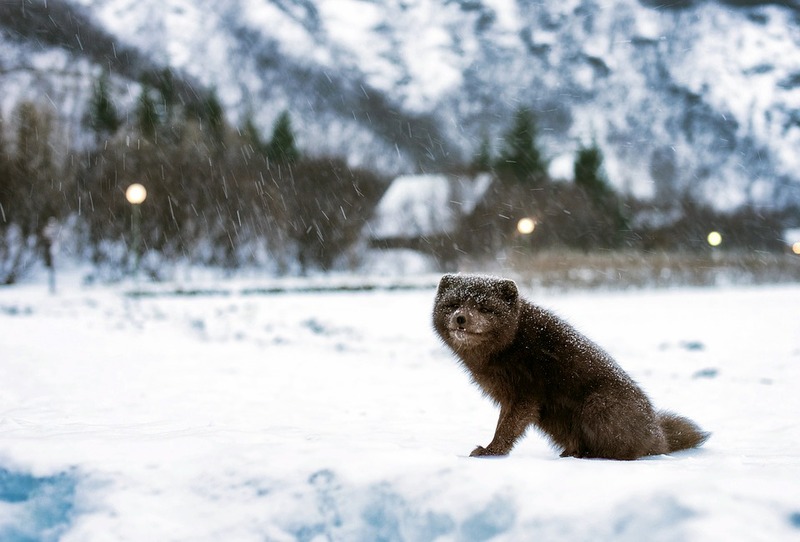 The goal of the researchers was to identify areas within the species’ ranges where both brown and winter coats co-occur. As you can imagine, if you have a white winter coat in a snow-covered landscape, you would be very well camouflaged. If, however, you have a white winter coat and there is no snow cover, you would stick out against the landscape and be easily noticed by predators. One of the most persistent signals of climate change is a decrease in the duration of snow cover, and previous research has shown that fitness, a measure of individual success and survival, is decreased for white animals in snowless regions. Therefore, in an age of decreasing snow cover and changing climate conditions, populations of animals that have a mix of individuals with brown and white winter coats will be more likely to persist. This is because brown individuals will have high fitness in years when snow cover is limited, while white individuals will have high fitness in years when snow cover is extensive. As a result, regardless of the snow conditions, individuals from the population will survive. L. Scott Mills and his colleagues focused on eight species that have seasonal coat colors: the showshoe hare, white-tailed jackrabbit, mountain hare, Japanese hare, short-tailed weasel, long-tailed weasel, least weasel, and arctic fox. For each of these species, they mapped the entire global range and identified regions where populations had only white winter coats, only brown winter coats, or a mix of white and brown winter coats. They were particularly interested in how large the regions with a mix of coat colors were, since these populations are seen as more resilient to climate change. Figure 2. A jackrabbit with a brown summer coat. Brown coats help jackrabbit’s blend into the surrounding foliage and escape predation. Photo credit: Pixabay. The species that had the largest zones with mixed brown and white winter coats were the arctic fox, white-tailed jackrabbit, and long-tailed weasel, while the mountain hare had the smallest zone with mixed coat colors. Due to the importance of these regions to the ability of these species to persist in the face of a changing climate, the authors identified regions where multiple species had mixed coat populations and determined their current conservation status. Globally, 13% of terrestrial habitats are protected areas. However, only 5% of the areas where multiple species had mixed color populations identified by L. Scott Mills and his colleagues were within these protected areas. These findings highlight the importance of protecting regions where species have the greatest capacity to adapt and evolve in the future and should be taken in to consideration by conservation managers. Figure 3. Between 10-57% of arctic fox populations are comprised of populations with mixed brown and white winter coats. Photo credit: Pixabay.